Download our 2018 Rodman Report Press Release. Download the full 2017 Rodman Report. Download the full 2016 Rodman Report. Download our 2016 Survey of Corporate Giving Press Release. * We invite you to share and/or republish the findings from our study. Please attribute your reference(s) to the Rodman Report: A Survey of Corporate Giving in Central Texas. Business philanthropy continues to grow in Austin, with more local companies giving to nonprofits and increasing their philanthropic budgets, according to an annual survey by Rodman and Associates, a local philanthropic advisor. Does your company have a philanthropy budget? 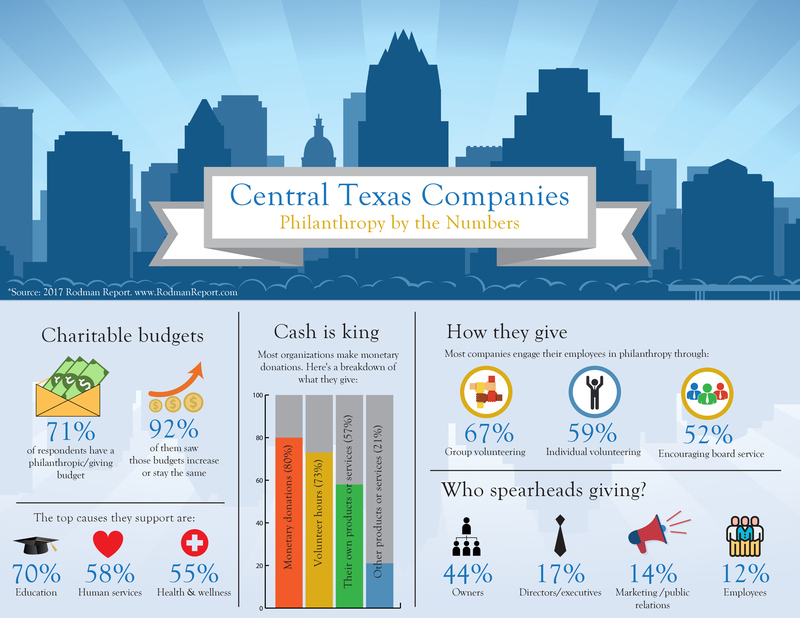 A big majority of Central Texas companies do, according to a report from an Austin group that examines corporate philanthropy in the area. Read the full article from the Austin Business Journal. In a special edition of Capital City Cares: Central Texas companies are making it their business to give back. Beth Kruger with Austin Gives, and Scott Patterson with Patterson-Hughes break down the numbers. Watch the full interview from KEYE.